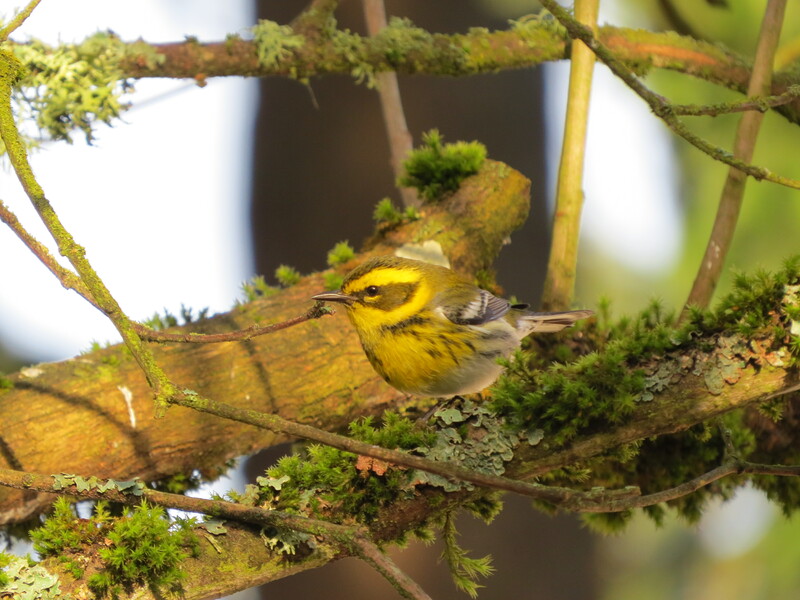 I’ve been following other local birding blogs, some of which are shared on the side-bar on my page. 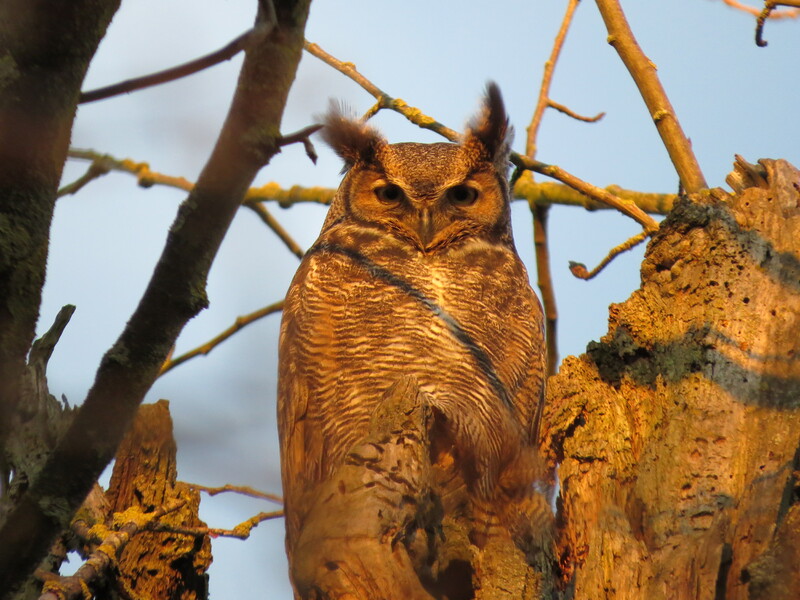 One in particular posted pictures of a Great Horned Owl with an owlet. I thought, I know the general birding areas in that neighborhood, I wonder if I could find that owl? I studied the pictures of the trees. 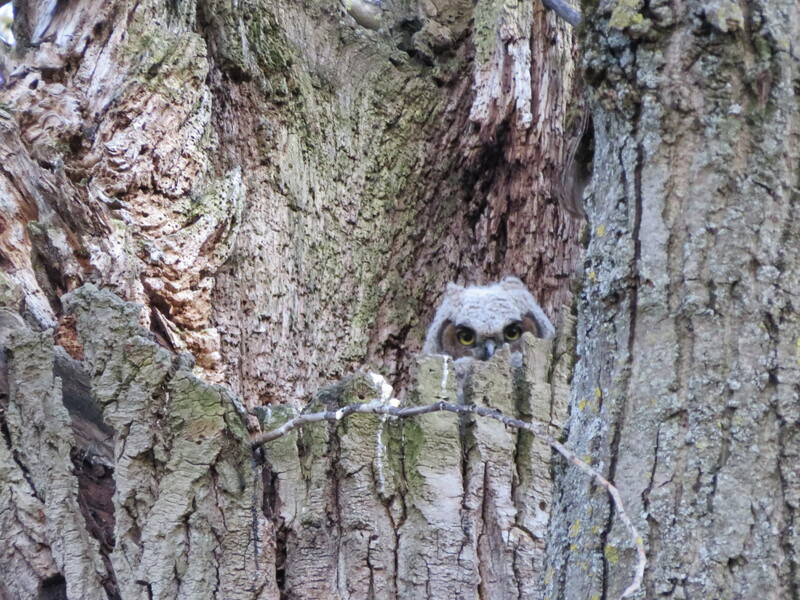 No specific location was given, and I wasn’t about to ask about such sensitive information, but I figured, best case I see an owl and owlet, worst case, I see other birds. Pretty much a win-win either way. I set off after work near sunset with a few destinations in mind. I stopped at one, hopped quickly out of the car, surveyed the area…no, not it. Stopped at another, scanned the trees with my binoculars and decided, nope, this wasn’t right either. It was like searching for a specific garment in a world of thrift shops. Then the third stop surprised me. This! This looks like the site! Could it really be? I felt a childish sense of adventure and savored the moment. I was a detective, hot on the birding trail. The trees and horizon matched, it had to be the site. I surveyed the tree-tops and there she emerged in all her stern glory. I couldn’t believe I had actually found the owl. Stupefied and coming down from my adventure high, I gazed and observed her from afar. Then I looked around me and felt a sense of sadness slowly sneaking in. 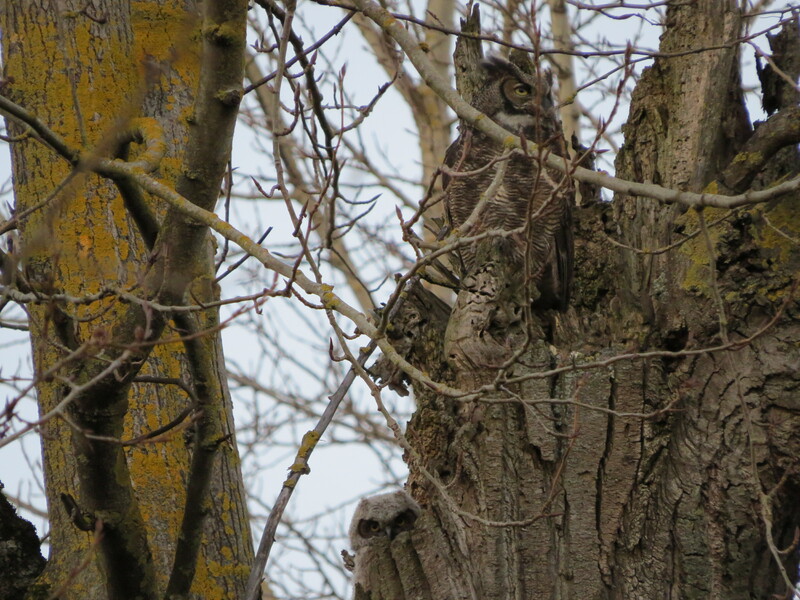 This was not dense wilderness, but a commercial-industrial area and to me the owl seemed exposed and vulnerable. This owl deserves better, I thought. 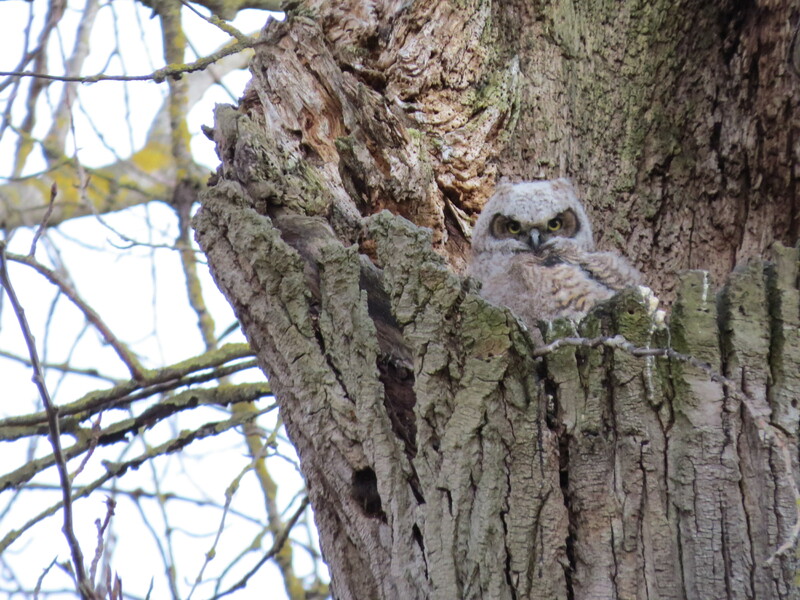 Then I started thinking about the impact of my own presence…and then I saw the owlet and I forgot about everything for a second. This was the first encounter I’ve ever had with an owlet. Pretty neat. I have a huge amount of respect and admiration for what animals in nature, especially birds, have to put up with just to remain alive; find food, brave winters, migrate, fight for habitat, avoid predation and hunting, and/or a combination of all of it. They also have to deal with people seeking them out. That’s essentially what most birding is, visiting known habitat areas in the hopes that bird encounters will result. People feel connected to nature when they experience it first-hand. This trip felt different. I’d gone after something specific. I had no idea that I’d actually find the owl and I suppose it’s similar to birders chasing a rare bird alert, but I’m not sure how I feel about this kind of birding yet. Overthinking it some? Maybe. In any case, I remain cognizant of the code of birding ethics. I think I have as much to learn about my emerging birder identity as I do about the birds. I recently completed Audubon’s Beginning Birding class taught by the kind and patient Laura Whittemore. She is the author of Laura Goes Birding blog, and a longtime experienced teacher and birder. The course includes one classroom session and two guided field trips and is excellent for beginners looking to learn basic birding skills such as identifying subtle differences between seemingly identical little brown birds. After these sessions, I’m still a beginner, but now I’m a beginner who knows to judge size and shape of the birds, decipher what it’s doing, recognize habitat, listen closely to songs, and pay attention to what type of bird it is – raptor? finch? sparrow? plover? I’ve learned to pay attention to field marks and other identification clues. These are skills that Laura makes look easy but for me will take practice and hopefully some day become second nature. It was especially fun to meet other new birders to share the experience with. The classroom was held at Audubon’s satellite East-side Branch at Leach Botanical Garden and the field trips took us to Smith and Bybee Lakes and Tualatin National Wildlife Refuge. Overall we saw (and/or heard) 32 species at Smith and Bybee and 33 species at Tualatin NWR including 4 new-to-me spices: Ruddy Duck, Eurasian Collared-Dove, Tree Swallow, and Green-winged Teal. I felt the class was beneficial enough that I’ve signed up for another in the series: Waterfowl I.D. for Beginners. It starts next week and I look forward to it! Find more pictures from the Smith and Bybee trip here, and Tualatin NWR here. Last year’s participants totaled over 144,000, providing the largest snapshot of bird populations ever recorded. The stats are pretty impressive; top 10 most birds reported, top 10 species recorded, multiple snowy owl reports, etc. There’s even a photo contest. While I didn’t participate last year (birds weren’t yet on my radar), this year I was thrilled to be a part of the project. In just 2hrs 15 minutes counting time over Feb 13th-16th, my backyard bird count totaled 83 birds and 14 species! The weather was great, I stocked the feeders, and I even added a tray to the sunflower feeder so birds have more room. The adorable Lesser Goldfinch have been a new arrival to the feeders lately, and I was happy to see them make an appearance. What’s the difference between an American Goldfinch and a Lesser Goldfinch you ask? I wondered this as well. 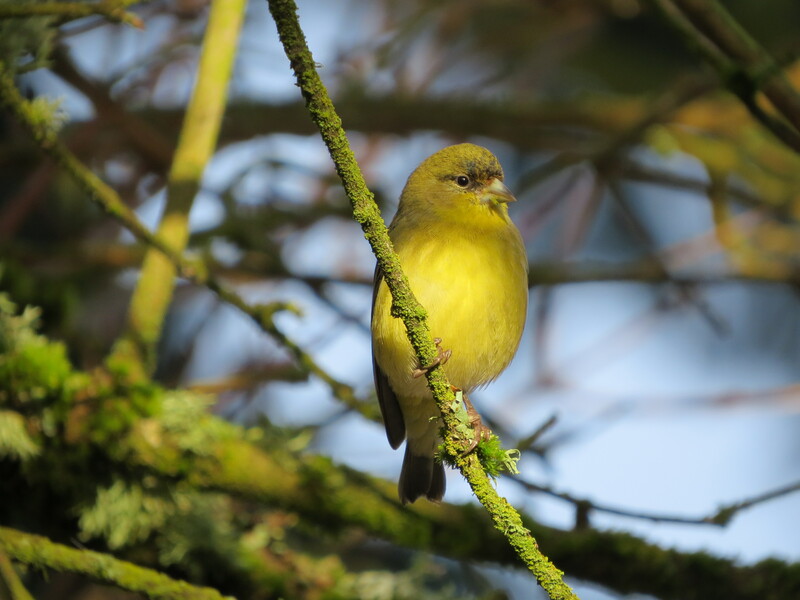 While both are in the same family (Fringillidae), Lesser Goldfinch are slightly smaller, they have a full black cap (males), a non-yellow back, and a slightly stouter bill. I found them super cute, perky, and “lesser” in name only. The biggest surprises during the GBBC were the Pacific Wren (formerly known in the west as Winter Wren), a bird I’ve mostly associated with dense conifer forests, and a Townsend’s Warbler! Such a beautiful bird and I was lucky to get a picture to confirm my sighting. As the Lesser Goldfinch would say, tweets and chirps!